We are a Health, Safety, Fire Risk and Environmental Consultancy based in Cheshire. With nearly a decade’s experience in ensuring compliance with statutory legislative requirements, across a broad spectrum of industries, we are committed to providing comprehensive, but commercially-minded services at competitive prices. 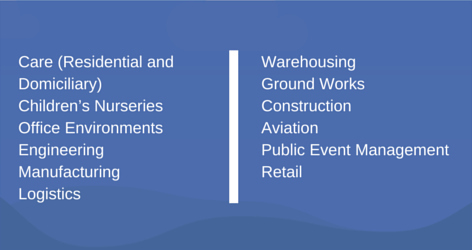 You can see we have a wealth of experience in various sectors. Health and Safety legislation has a reputation for being restrictive and excessively demanding on business owners, particularly SMEs, we don’t share or encourage that view. Health and Safety legislation has contributed to the UK having one of the most impressive safety records in the world. We specialise in ensuring that our clients achieve compliance with the relevant legislation efficiently, effectively, and economically, so they can concentrate on doing whatever it is that they do best. We know that our clients want to protect the health, safety and welfare of their workforce, customers, and visitors, without compromising their bottom line. We implement systems and procedures that allow them to do just that. At IFB we have been working with Simon for a number of years and have been really impressed with his expertise and flexibility in supporting our business. He has helped us to develop a full set of working procedures, as well as training our staff, and is always at the end of the line to help with any day-today queries. I would recommend Rhino Safety to any organisation looking to improve their business and reduce risks to ensure that their operations are much safer for employees and customers alike. Simon has developed Rhino Safety into an extremely professional outfit. The Nantwich Food Festival has 40,000 visitors during the 3 day event. We have worked closely, planning H and S with Simon. During the festival Simon and his team will inspect and monitor but prior to the date Simon is working with us to set up the correct procedures and documentation to run a safe Festival. Simon will train the many volunteers who work with us. Rhino Safety will work with contractors and exhibitors monitoring risk assessments before during and after the festival to ensure we run a safe and secure festival. Simon is also working with the statutory bodies on our behalf liaising with many organisations. Simon and his new company Rhino Safety give us confidence to deliver a world class event . Simon has been representing Simarco for several years on all Health and Safety matters. I find his approach to Health and Safety very refreshing and he always ensures that recommendations made, benefit both the company and it’s employees. He removes the ‘stigma’ that Health and Safety has within some workplaces by his approach. This enables all staff to ‘buy in’ to the importance of Health and Safety. Drop us a line anytime, and someone from our team will get back to you as soon as possible.